Khyentse Yangsi Rinpoche, aka Ugyen Tenzin Jigme Lhundrup (Tib. ཨོ་རྒྱན་བསྟན་འཛིན་འཇིགས་མེད་ལྷུན་གྲུབ་, Wyl. 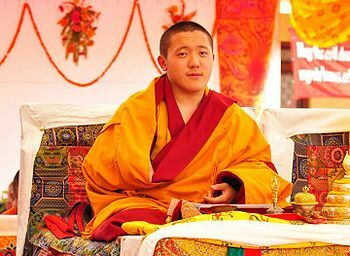 o rgyan bstan 'dzin 'jigs med lhun grub) (b.1993) — the reincarnation of Dilgo Khyentse Rinpoche, born in Nepal on the 30th of June 1993, as the son of Tsikey Chokling Rinpoche. Trulshik Rinpoche had numerous dreams and visions that clearly indicated the identity of the incarnation. Later, His Holiness the Dalai Lama confirmed that this child is the tulku of Dilgo Khyentse Rinpoche. In December 1996, at Maratika cave, Trulshik Rinpoche performed the ceremony of offering a name and robes to the young tulku. His actual enthronement took place at Shechen Tennyi Dargyeling Monastery in Nepal, in December 1997. Khyentse Yangsi Rinpoche is being educated in the quiet of Bhutan under the guidance of Shechen Rabjam Rinpoche and is currently following a complete nine-year shedra course. ↑ This date corresponds to the 10th day of the fifth Tibetan month of the Water Bird year, and is regarded as Guru Rinpoche's birthday according to the Mindroling tradition. Kyabje Dilgo Khyentse Rinpoche—Centennial Celebration booklet, Shechen Publications, 2010, pages 46-53. Dilgo Khyentse Rinpoche, Brilliant Moon: An Autobiography of Dilgo Khyentse Rinpoche (Boston & London: Shambhala, 2008), pages 291-292. Rabsel No 5, Winter 1997, Shechen Publications. View magazine, issue 6, 1996, 'Dilgo Khyentse's Incarnation', pages 34-35. This page was last edited on 12 June 2018, at 13:39.